Microsoft said that U.S. college students will be able to get the software for $30. So i tried it and it worked... All that you need is email address that is mapped to a College. 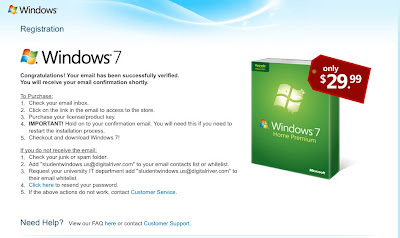 Thank you for placing your pre-order from the Windows 7 Offer Online Store on September 17, 2009. Your order will be available for downloading on October 22nd, 2009, at which time you will receive an email reminder. If you purchased a backup DVD, it will be shipped around this date and you will receive a separate email confirmation. The following email is a summary of your order. Please use this as your proof of purchase. Your credit card will not be charged until your order is available for download, at that time please look for Windows7US on your credit card billing statement. How do you have a college email address?